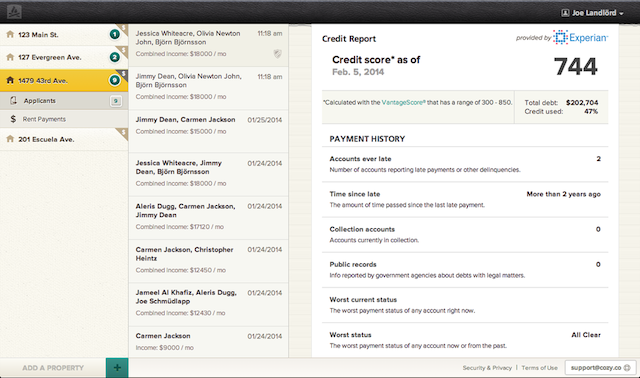 Cozy is tackling another part of the rental process today with the launch of a new feature for credit checks. The startup, which raised a Series A led by General Catalyst last year, already allows landlords to perform tasks like screening tenants and collecting rent. Now, when a landlord finds an applicant that they’re interested in, they can actually request the credit report from the Cozy website. Then, the applicant can choose whether or not to approve the request (presumably they’ll say yes if they want the apartment). Co-founder and CEO Gino Zahnd said this changes the process in a few key ways. First, it means that the applicant doesn’t have to give their Social Security number to the landlord of every apartment that they’re applying for. Obviously, that’s a security issue for the applicant, but Zahnd argued landlords don’t necessarily enjoy being stuck with a stack of sensitive personal information to dispose of, either. “We’re completely changing who controls the information during this process,” he said. Third, after the initial report, every follow-up credit request is a “soft inquiry” that just updates your information, rather than a “hard inquiry.” The important difference? A hard inquiry affects your credit score, while a soft inquiry doesn’t.